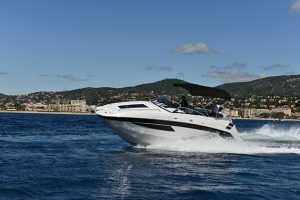 pretty, if somewhat impractical, AM37 sportsboat and Mercedes Benz has its Arrow 460 superyacht tender. 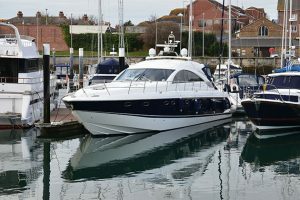 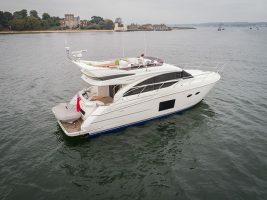 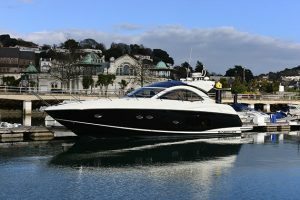 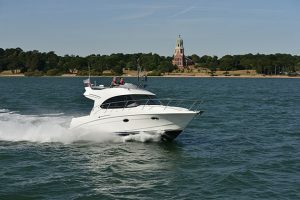 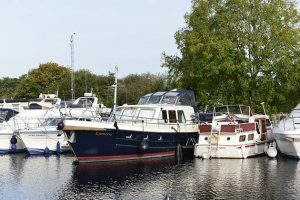 But one boat manufacturer teamed up with an automotive design house a decade ago – Bavaria Yachts approached the entirely appropriately named BMW (Bayerische Motoren Werke, or in English, Bavarian Motor Works). 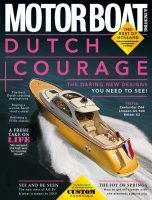 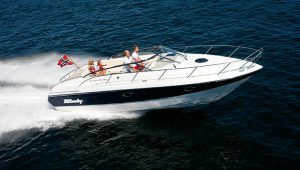 In fact it was BMW Group’s DesignworksUSA studio that actually collaborated with the German boat builder. 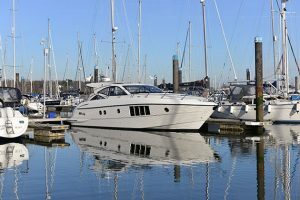 First from its pen was the rakish but extremely rare Deep Blue 46. 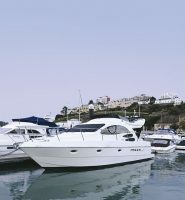 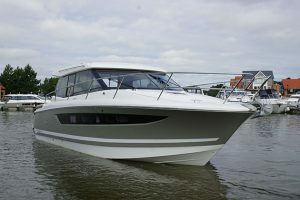 The Sport 28 was the design company’s first mainstream boat, and it launched in 2009. 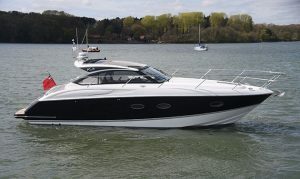 The Sport 28 represented a big style shift from its worthy but dull predecessors. 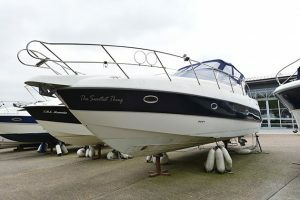 Out went the two-tone blue and white hull, in came a striking new look. 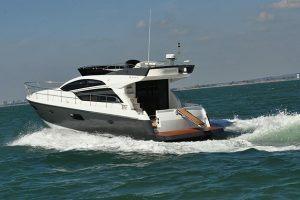 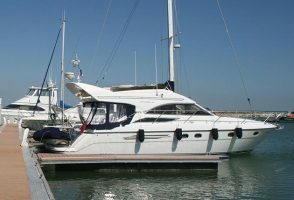 Sculptured topsides neatly disguised their height with moulded swage lines, allowing the deck profile to be kept super low for a sleek appearance, enhanced by the low profile wraparound windscreen and forward raked radar arch. 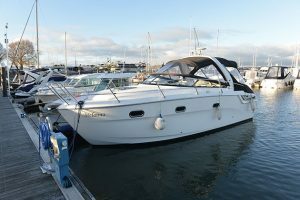 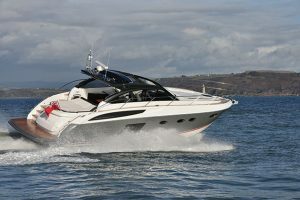 All of which suggests style over substance, but in fact the Sport 28 is a surprisingly roomy and practical boat. 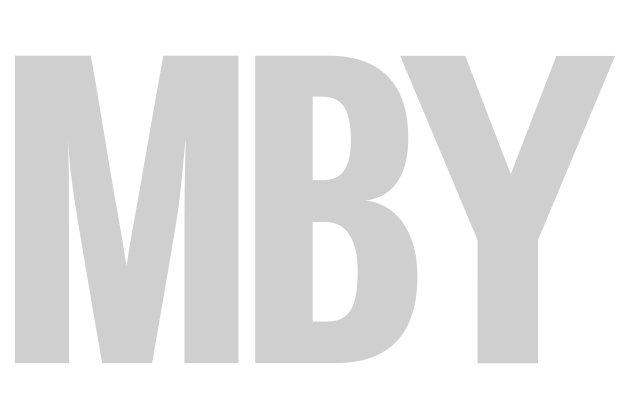 The generous beam is key to both of these things. 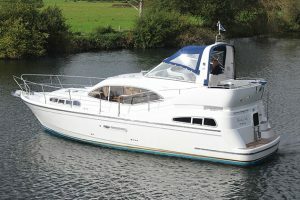 At almost three metres wide, there is space for generous side decks protected by high rails that safely guide crew right back to the cockpit. 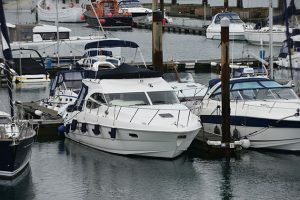 Bavaria didn’t waste too much length to the bathing platform either, although an extended version was on the options list for anyone requiring more space for watersports.